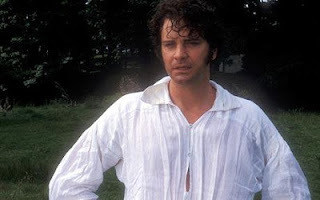 What is a post about Mr. Darcy and P&P without wet Colin Firth? First I am going to come out and say it. 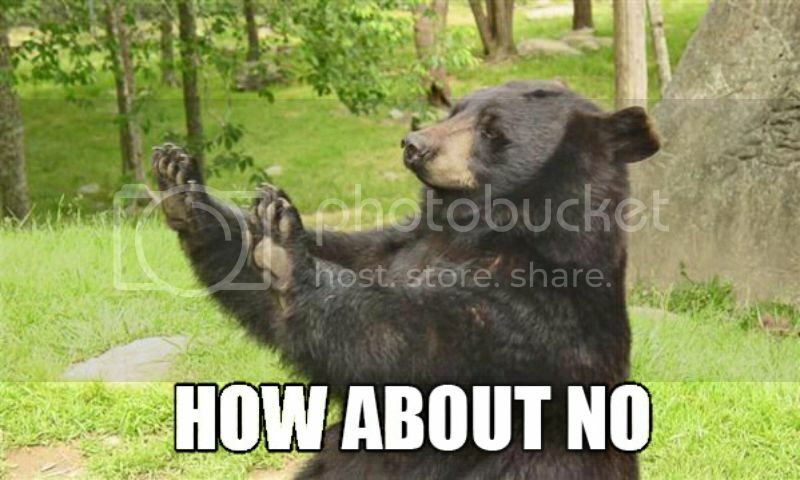 I still have yet to read Pride and Prejudice. 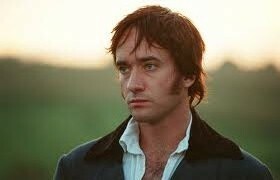 Or really any Austen. What I know about her and her books consists of what my professor and I chatted about walking around on the Roman Forum on a high school trip to Italy, the movieThe Jane Austen Book Club, some Jane Austen TV movie that I feel like I may have seen but can't remember the title, and of course the Pride and Prejudice movie and BBC mini series. So I mean I have a lot of secondary sources, but I have yet to read her words and have them wash over me to take me to a time where men were gentlemen and women were future wives. I'll put this here, too. That said, I thought Austenland was a cute book, but I am not in love with it. Maybe it's because of all the things mentioned in the previous paragraph. Jane, our heroine, is a women in her early thirties who has had the worst luck we relationships. Each chapter actually opens with a small paragraph outlining them. They are really the pits. She partly blames her lack of luck with her secret obsession with Colin Firth as Mr. Darcy. Nothing can compare to that, can it? Well she gets the opportunity through a series of events to go to this rich people Disneyland called Austenland. They take your oodles and oodles of money and in trade you get three weeks of the full pre-air conditioned, corseted, sewing all day Regency experience. She opts to go to get rid of her silly obsession once and for all. Most of the book chronicles her time there. Most of the people there in the house she is staying at are paid actors there to give the experience authenticity, but there are at least two other women who paid for the experience and are also guests. Now that I summarize it the plot is rather dull, as I suppose country life would have been at that time. She gets herself two "love interests" and is all in a tizzy about her life for most of the book. It is interesting to see how much the people playing this world take it seriously. Like it is a Big Deal when anachronistic things happen. They are Regency down to the underpants or lack of them. The romance itself was nice, I guess. Nothing super steamy and nothing super dull. I enjoyed the paralels in all of the characters to what I know of P&P. I didn't get any other references to things like Emma if there were any. Overall it was a quick, light jaunt into the world of one woman as she tries to find out who she is and stumbles into a strange scenario in the process... trying to figure out what is real and all that. If you like light romantic romps into the past, this would probably be right up your alley. There is some fun twists and I did get caught up in the story a bit. I definitely don't regret reading it, but I don't think I'll be reading the sequel. There is one more thing. It has absolutely nothing to do with the plot or the characters but one itsy bitsy line near the end that talks about kissing on an airplane all the way from London to New York. In Coach. On a plane that is rather crowded. As a frequent airline traveler, I only have one thing to say. 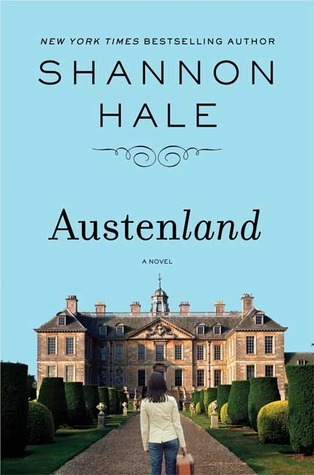 PS: Jana has also reviewed Austenland and gave it five stars. Check out her review from July 2010! I am a huge Jane Austen fan and am a little bit in love with Colin Firth myself. Therefore, this book sounds amazing to me! I have to say, though, that I agree with you about the kiss on the airplane. EWWWW! What would the other passengers be doing/thinking??? I think the premise for this book is so weird and yet I bet there are loads of people (mostly women) out there who would want to do just as the MC does here. I love reading Austen novels but I am pretty happy living in our own time. You should definitely give one of her novels a try though: P&P as her most famous, Persuasion as shortest, Emma is absolutely excellent though! I'm dying to read this book and see the movie...I don't have super high expectations for either but as someone who would totally visit Austenland I feel it's necessary. Two things though: 1.) There's a SEQUEL? I feel like that's a bit much. and 2.) EWW to that last thing. Not cool. I read this book recently, and while it certainly wasn't a masterpiece, it was quite entertaining. A guilty pleasure I cannot be entirely guilty about. I read the sequel as well, and it was so... weird. Really. The author describes it as "Jane Austen meets Agatha Christie" - which probably says it all. It is so bizarre and not in a good way. I've read everything by Austen and am a fan of Hale's in general, but this book really didn't stand out for me either. I mean it was OK, but it wasn't anything spectacular. However, I've recommended it to people who like this sort of read and they've LOVED it, so it all depends on your preference I suppose...So you have an accurate review in my opinion :) Also, it's a movie now apparently so I may check that out just to see how they've done the costumes and what not. I've only read Sense and Sensibility by Austen, and the start of Pride and Prejudice, but I'm still a big fan of the world Austen created. I like people playing in that world, whether it's adaptations on the big and small screen of her work, or stuff like Pride and Prejudice and Zombies. However, if you're going to play in Austen's world you need to do it really, really well, and while this book sounds fun, it doesn't sound amazing. 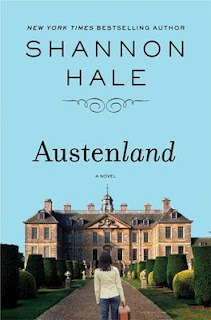 I loved the story and secretly wish I could go on an Austenland vacation. They made a movie that debuted at the Sundance Film Festival in Park City Utah, I hope it makes its way to the big screen. Omg, this sounds right up my alley. I loved Pride & Prejudice and own the BBC mini-series on DVD. I'm a little obsessed with Colin Firth as Mr. Darcy, myself. I definitely have to read this! I would definitely pay money for a themed park like Austenland. Even if you're not obsessed with Jane Austen, it sounds like a fascinating idea and could still satisfy historical fiction fans, I'm sure. That's too bad this book didn't work out for you quite the way you'd hoped it would. It does sound like it is something written about and for Austen fans. I'd encourage you to read Austen's works though!